Although we tend to focus on our investment portfolios, Social Security benefits, and annuities when we think about retirement, these aren't the only sources of household wealth. In fact, they may not even be the largest sources of wealth. For young people just starting a career, human capital (the capacity to exchange labor for wages over their career) is likely their greatest asset. In many older households home equity is the largest component. By focusing solely on our portfolios, we may overlook much, perhaps even most, of the household wealth at our disposal to fund retirement. A recent paper by David Blanchett and Philip Straehl entitled, “No Portfolio is an Island” (download PDF) separates household wealth into real estate, financial capital, pension wealth and human capital. Real estate wealth is home equity and other real estate investments. Financial capital includes our savings and pension wealth is the present value of Social Security benefits and pensions. A young person beginning her career may have an abundance of human capital, or the present value of a future lifetime of paychecks, and a small amount of pension wealth, the present value of future Social Security benefits. She will likely own no real estate and have limited savings. Financial wealth will typically peak around retirement age when she stops saving and begins spending those savings, and her human capital all but disappears. By the end of life, her wealth may largely consist of home equity, unless she uses it to fund retirement. This represents typical wealth changes and yours might be quite different, but the hypothetical illustration is informative. The diagram suggests that focusing solely on financial wealth poses the biggest disconnect for young savers, who have mostly human capital, but it also illustrates for retirees and those approaching retirement how dramatic the change can be once the paychecks end. As the authors point out, previous research has shown that other household wealth investments may exceed investment capital. In 1993, Nobel laureate, Gary Becker, found that human capital made up four times the value of all other wealth combined. In 2000, Heaton and Lucas found that human capital makes up nearly half of household wealth while financial assets constitute less than 7%. 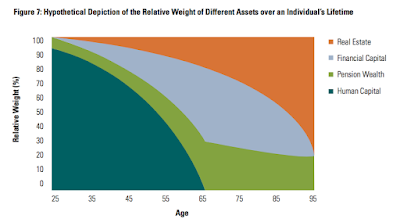 In the above diagram, granted hypothetical, financial assets never exceed 50% of wealth so, the authors ask, how can an asset allocation based on less than half your assets be optimal? 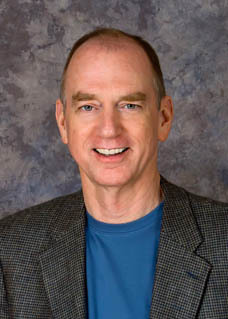 Primarily, Blanchett and Straehl recommend that we broaden our focus from the narrower investment portfolio to the entire household balance sheet and recognize that some of these components of wealth can be highly correlated, which means “risky”, in the sense that that some might tank simultaneously. In 2007, for example, both the stock market and the real estate market crashed. The Tech Bubble provides a historical (perhaps even historic) example. Many Enron employees held a lot of Enron stock in their retirement portfolios, so their human capital (their paychecks from Enron) were highly correlated with their retirement savings. When Enron went under, employees lost both their jobs and their retirement savings. Enron succumbed to accounting fraud, but the employees of many legitimate high-tech companies found themselves in a similar situation. Blanchett and Straehl recommend that if we work in the tech industry, for example, there are highly correlated stock sectors to which we should reduce our exposure. The authors draw on modern portfolio theory (MPT) for their analysis. MPT shows that we can combine uncorrelated assets to create an optimum return for a given level of risk or vice versa. While MPT optimizes stock and bond allocations to find the least risky way to earn an expected rate of return at a point in time (or the maximum return for a given level of risk), Blanchett and Straehl apply the same thinking to their four categories of household wealth over a life cycle, pointing out that these broader asset classes can be correlated, as well. The result can have a significant impact on our portfolio allocation. The authors find differences of up to 20% for optimal portfolios. Viewed independently, we might conclude that a 50% stock allocation is appropriate for our investment portfolio. For those of us whose career is more “bond-like”, or who have a lot of pension wealth, a higher stock allocation might be appropriate when we consider total household wealth. If you are unfamiliar with the concept of having a career that is either stock-like or bond-like, it comes from the work of economist, Zvi Bodie. Moshe Milevsky published a book on the topic. Here’s an example of the concept. In the late nineties, I left a job at Cable & Wireless, a British phone company founded in 1866. I had a very nice and very dependable salary and even earned a small pension, but I owned no company stock. I traded this bond-like, relatively safe job with limited upside for a position at America Online with no guarantee that the company would even survive. I accepted a significant pay cut in exchange for stock options that would pay off nicely if the company thrived. I traded a bond-like job for a stock-like job. Many of the young employees I knew at AOL held nearly all their wealth in AOL stock options yet, in the heady days of the Tech Boom, invested everything they could in more tech stocks. Some even bought more AOL stock. Those that got out before 2000 won big. Many of those that held on lost everything. Bodie, Milevsky, Blanchett, Straehl and others would recommend that they should have invested outside money in safe bonds, instead. If you lack a basic understanding of MPT, you might find the Blanchett and Straehl paper dense. Michael Kitces wrote an excellent review of the paper that is more accessible, but still a bit challenging. It’s probably impractical for most people to perform mean-variance optimization on their choice of careers, regional real estate prices, Social Security benefits and portfolio allocation as Blanchett and Straehl did. There are some general conclusions, however, that we can take away from the research and apply to our own retirement plans. Make sure your retirement plan considers all of your resources, not just your savings. If your job is bond-like, invest a little more in stocks and vice versa. Think about how the various components of your wealth might be correlated. Not investing most of your retirement savings in the company that hands you a paycheck should be a no-brainer after Enron, but real estate prices might also be highly correlated with your career. If you take this approach, you need to be aware that your investment portfolio will be allocated to optimize risk and return for your total household wealth. You may be disappointed in your investment returns if you use those alone as the benchmark for your financial success instead of your total wealth. I've meant to write a post about academic papers for some time and I received an email recently that gives me a great opportunity. But the problem, I believe, is not with the academic research – which is as it should be – but with our expectations and our over-reading of the conclusions. Sometimes, we just miss the point. Other times, we try too hard to convert theory into practical advice. And lastly, we're not the intended audience. Let's look at those one point at a time. It seems that many people unfamiliar with how academic research works are looking for a study that shows the one way to plan for retirement that is better than all previous recommendations and is the single best way to plan. As they say on police dramas, that ain't gonna happen. Research is often an “experiment” that provides new information that we should consider and perhaps use to modify our previous beliefs to some extent. Or as someone said, “science is the process of continually improving your answer.” If you expect the next big academic paper to provide “the answer” that supersedes everything we used to think that we knew was correct, your expectations are too high. A good piece of research simply improves on the previous answer. It rarely replaces it. Molding theory into practical application is the next challenge. Sustainable withdrawal rates research is, I think, an excellent example. Most studies use constant-dollar withdrawals, a spherical cow that is useful for research but problematic in practical application. No rational retiree is going to continue to spend the same amount every year once she observes that she is going broke. The technique is useful to understand the process of sequence of returns risk, but it is way too simple a model to predict outcomes for an actual retiree. Unfortunately, Money magazine and other popular media outlets translated this research directly into practical advice for several years before the 2007-2009 market crash convinced them that people really need to spend less money when they become less wealthy. The risk is not so much that you will deplete your savings with SWR as that you will irretrievably lose your lifestyle. That wasn't the point of the research, but the effects were predictable. Clients asked if I thought they should be following a rising glide path and invest more in equities when they are older. I told them that they should decide that when they are older – I have no idea what their financial situation will be when they are 95. Wade Pfau agreed, telling me that a custom asset allocation will always be better. He believed their findings simply suggest that if we knew nothing about a client other than his or her age, or if the retiree were only willing to do the absolute minimum of planning, a rising glide path would be the best bet. He added that this is probably the best strategy for a target-date mutual fund that needs to serve a broad range of retirement investing needs. He also felt that the most interesting finding of the research is that you can sometimes “reduce both the probability of failure and the magnitude of failure for client portfolios” by increasing market risk. Not that everyone should adopt a rising glide path upon retirement and stick with it come what may, though this is what many concluded. Sometimes, we just miss the point. David Blanchett wrote a paper that inspired the term “the Blanchett Smile” (download PDF). Many readers understood his findings to suggest that expenses begin to decline at retirement, bottom out about the mid-point, and then increase until death, in the shape of a smile. The “smile” Blanchett found, however, showed the acceleration of spending, not the amount of spending. The amount always trended downward, at about 2% or so per year for appropriately-spending retirees, throughout retirement. Only the acceleration of the downward trend (it's first derivative) eventually turned upward. Misreading academic papers isn't a problem only among do-it-yourself retirees. After I wrote about this at Advisor Perspectives, a top-notch retirement adviser privately thanked me. He said that he had been present when Blanchett presented the paper and that he completely missed this point, as did, he believed, everyone sitting near him. I'm not suggesting that you stop reading academic papers on retirement finance. I am suggesting that you understand their intent and use considerable care in trying to apply their findings to your own personal situation. Treat them as another piece of evidence and weigh them accordingly. While academic papers aren't intended for a broad audience, the authors of those papers often write books, blogs and columns for the press that are. Wade Pfau, for example, does an excellent job of explaining his research to a broader audience of advisers and even do-it-yourselfers at several places, including newsletters to which you can subscribe, the Advisor Perspectives website, and his own Retirement Researcher blog. William Bernstein has written many brilliant books and over the years has intentionally made them more and more accessible. Dr. Moshe Milevsky is another excellent writer. While I don't recommend most people tackle his papers about lifetime probability of ruin and the reciprocal gamma distribution (it kept me up nights until my tenth reading), I just finished the second edition of Pensionize Your Nest Egg, co-written by Milevsky and certified financial planner, Alexandra Macqueen, and find it quite readable. (Macqueen clearly helps balance Milevsky's inner quant.) It provides a strong argument for the circumstances under which and to what extent one should employ annuities. Spoiler: if you have a lot of wealth or a little, they may be less effective than for those in between. A reader recently asked my opinion on long-term care (LTC) insurance policies. My position is that many retired households, perhaps most, will not be able to afford LTC premiums and will have no decision to make. Wealthy households will be able to self-insure. That leaves the households in between with a decision to make. For those households, purchasing a long-term care insurance policy can be the lesser of two evils. The problems with LTC insurance are well known (see An Economist Explains the Dangers of Long-Term Care Insurance). Many carriers have found the policies unprofitable and have simply gotten out of the business. According to a recent Wall Street Journal article, five of the 10 largest LTC policy sellers, including MetLife and Prudential Financial, have sharply reduced or discontinued sales entirely since 2010. Buying insurance when many insurers are abandoning the market for that insurance is risky. Some Boomers have been encouraged to buy LTC policies because they worked well for their parents, but this is not your father’s LTC policy. Rates increased substantially after insurers realized they had initially underpriced policies and would need to raise rates substantially if they were to make a profit. You're unlikely to get the deal your parents got. Perhaps the greatest problem with LTC insurance is the possibility that an insured retiree will let his or her policy lapse and, after making large premium payments for years or even decades, not be covered when LTC insurance is actually needed. "Next up is my long-term care insurance policy, which now costs $1,357.85 a year but, this letter tells me, is raising its premiums by 48 percent — unsurprising but still breath-taking. It would be way more than that, the MetLife representative told me by phone, but for the fact that New York State has one of the nation’s most stringent insurance commissions. . . In 2019, MetLife told me, the state commission will again allow the insurer to raise its prices. When that happens I’ll reduce my benefit duration from three years to two. Is there a point when I’d flush down the toilet 13 years of premiums already paid? I haven’t a clue." Although the probability that a retiree will need some amount of long-term care is significant, the probability of a financially catastrophic stay in a long-term care facility is relatively small, as I described in an earlier post. Many stays will be quite brief and some can be paid out-of-pocket. Long-term care expenses can range from informal care in the home to expensive nursing facilities, from short stays that can be paid out-of-pocket to lengthy stays with catastrophic costs. The following table (click to enlarge) is from a study entitled, "Long-term care over an uncertain future: what can current retirees expect?" Notice that while 69% of people over age 65 required some form of long-term care, 31% required none at all. Another 29% required stays of two years or less. The scary number is the 14% that required more than 5 years of in-facility care. The odds of that happening are somewhat low, but the magnitude of the risk can be financially catastrophic and that's what we need to prepare for in some way. Medicare does not cover most long-term care costs. Medicaid may, but only after most of the retiree's financial resources have been spent. It is intended to cover indigents. To use it for long-term care, you must become one. Let me repeat that. About 30% to 40% of 65-year old's will eventually allow their LTC policy to lapse, forfeiting all benefits after having paid years of premiums. Insurers bemoan low lapse rates of 1% to 2% for these policies as a justification for rate increases, suggesting they are on the hook for underpriced policies issued years ago that buyers are unwilling to relinquish. This is an annual lapse rate, however, and a 1.5% annual lapse rate over a 30-year retirement results in about a third of policies lapsing over a 30-year retirement. 1. Lapses could be due to the burden of insurance premiums, a strategic calculation that care use is less likely, or poor decisions due to declining cognitive ability. Why do retirees allow their LTC coverage to lapse? Insurance premiums could increase and render the policy unaffordable, or they could remain the same while the retiree's ability to pay declines. That doesn't mean the premiums would have been spent totally in vain, because risk was protected prior to the lapse and that has value. But it does mean that the retiree has a potentially huge uninsured risk going forward. It would be a poor outcome, indeed, to pay premiums for decades and then suffer devastating long-term care costs after the policy lapsed. 2. The analysis finds support for both the “financial burden” and “cognitive decline” explanations. The research finds that many LTC policy lapses are the result of either premiums that the retiree can no longer afford, or the retiree losing the mental acuity needed to maintain the policy. They might forget to make premium payments or simply decide, incorrectly, that they no longer need the policy. 3. The consequences of lapsing are significant, as lapsers are actually more likely than non-lapsers to use care in the future, partly due to cognitive decline. Interestingly, the study found that retirees who let their policies lapse are more likely to need long-term care in the future than those who don't lapse. This is partly explained by the fact than impaired retirees are more likely to let policies lapse and impaired retirees are also more likely to need long-term care. 4. Thus, for some lapsers, having insurance could be counterproductive as they buy it to protect against risk but drop it just when the risk becomes more likely. In other words, if you’re going to allow the policy to lapse, you’re probably better off not buying it in the first place. Of course, when you buy the policy, it is probably your intention to keep it in force. Joe Tomlinson, whose opinion I respect most on retirement insurance issues, suggests that purchasing the policies, despite their known faults, is the lesser of two evils. In AdvisorPerspectives, Joe expressed his preference for standard LTC policies over hybrid policies (life insurance or an annuity with an LTC rider) or self-insurance. Retirement advisor, Dana Anspach, wrote a nice piece, "What Happens When You Don’t Have Long Term Care Insurance? ", explaining the downside of not purchasing LTC insurance. I agree with all of it, perhaps with the exception of identifying "the worst case scenario [as] where one spouse remains healthy and retains most of the ongoing costs of living independently and the other spouse needs care in assisted living or nursing home." I think paying premiums for decades and then letting a policy lapse just prior to incurring huge end-of-life costs has a strong claim on that title. I believe that you should forego these policies if you can’t afford the premiums, and potentially large future premium increases, or if you are wealthy enough to self-insure. If you fall in between, I don’t believe there is a single clear winner in the numbers. There are several strong arguments in favor, and several against. Your decision will largely depend on your unique financial situation and your risk tolerance. For some, insuring the risk of catastrophic end-of-life medical expenses is worth a lot. It lets them sleep at night. I hope that explaining the issues involved will help with your very difficult decision. I have a client who was defrauded by an unscrupulous financial adviser. He was caught and found guilty and forced to make reparations. She won't completely recover her losses, but this is a far better outcome than most victims of elder fraud will experience. I have posted on this topic before. Because elder fraud is so pervasive, so devastating and growing, I felt it was time to write another. The November 2015 Consumer Reports magazine notes that a recent study by the Journal of Internal Medicine found that about 1 in 20 elderly Americans has been financially exploited. If you're a fan of the 4% Rule (I'm not), then perhaps you think you should have no more than a 5% chance of outliving your money. The chances of losing your savings to elder fraud, instead, are about the same. Quoting again from that C.R. article, "The Federal Trade Commission says that fraud complaints to its offices by individuals 60 and older rose at least 47% between 2012 and 2014." I strongly recommend that if you are in or approaching retirement, or you have parents who are, that you read the article. Those who don't subscribe to Consumer Reports can read it here. Elder fraud can destroy retirements when victims are older and unable to recover financially. Aside from getting lucky, as my client partially did, the only recourse may be the possible deduction of those losses on a tax return, but many retirees won't have enough income to fully use the deduction even if it is available. There are several limits on deductibility. Ken Fisher's book, How to Smell a Rat: The Five Signs of Financial Fraud, has long been a favorite of mine. It's an easy read and provides simple rules to greatly reduce the risk of fraud. One of those suggestions, never give custody of your money to your financial planner, might have protected my client's savings. Financial planners can manage your money without having custody of it. Granting them custody opens the opportunity for your planner and your money to end up in an unidentified Central American country together with no forwarding address. Please be careful with your hard-earned retirement savings – a bear market isn't the only way to lose them. You may be equally likely to lose your savings to fraud. And if you have an older parent, please watch out for them, too. Reading Fisher's book and this Consumer Reports article are a great way to start. I added a "Follow Me on Twitter" button at the top right to make it easy for you to follow @Retirement_Cafe. Sometimes, I find important information that's too concise to warrant a blog post – interesting papers to read, other bloggers' posts, or tweets from researchers like Wade Pfau, Moshe Milevsky, Michael Kitces and others – and I will post these on Twitter. If you're not familiar with Twitter, check out this starter's guide. It's very easy to use and a source of a lot of timely information. As you find "Tweeters" you like, you can follow them, as well. Twitter apps are available for your smart phone, tablet and desktop, or you can simply use the twitter.com website. As I mentioned previously, I have also acquired the domain name for TheRetirementCafe.com to make it easier to reach and share my blog. Wade Pfau's Retirement Researcher blog received a disquieting question from a reader last week. The reader asked Wade how he, the reader, would have done had he invested his FICA payments over the years in the stock market instead of paying into Social Security. We assume the reader knew that wasn't legally possible. Wade later noted that his analysis didn't include spousal benefits. Spousal, survival, and other Social Security benefits are huge, so if the reader is married then he would have been worse off investing his FICA taxes. Significantly worse off. The question is disquieting because it suggests that the reader may not appreciate the difference between insurance, like Social Security Retirement Benefits, and investments. They aren't apples and apples. Social Security retirement benefits, officially named Old Age and Survivors Insurance (OASI), are insurance against longevity, or living a very long time and running out of wealth. It was passed into law in the 1930's because Americans felt that old people who couldn't work any longer shouldn't live in poverty. We pay the premiums for this insurance with FICA taxes. OASI is available not only to Americans but to anyone who works legally in the U.S. and pays FICA taxes. Benefits are based on how much we pay in FICA taxes over the years. Insurance is a contract that pays us when bad things happen in our lives but typically pays nothing if we don't suffer a loss. An investment is something we buy with the hope of selling at a higher price in the future. If you live a long time after retiring, you will be better off buying insurance like fixed annuities or more Social Security benefits, which you can effectively do by delaying claiming. If you live less than an average lifespan, you may well be better off investing – or maybe not, since investments can lose as well as gain. Investing seeks to maximize spending in retirement but guarantees nothing, while insurance guarantees that you will have at least some income no matter how long you live. If you are healthy, you cannot predict how long you will live, which makes it a lot harder to choose between the two. Theirs are two very different promises. When you buy stocks and bonds you “sell cash and buy risk.” Cash includes things like actual cash and short- to intermediate-term Treasury bonds. Risk means risky assets, like stocks and riskier bonds. When you buy an annuity or increase Social Security longevity insurance by delaying your claiming age, you are buying safety from longevity risk. Another way to say this is that you are paying an insurer to accept your longevity risk. Your total household balance sheet, as RIIA likes to say (download PDF, should include all social, financial and human capital. The risk you buy when you invest in stocks and bonds is market risk, or capital market risk, and this is a risk to your financial capital. When you buy an annuity, increase Social Security benefits by delaying claiming age, or buy disability or life insurance, you're protecting your human capital. Claiming Social Security benefits early and investing them would mean accepting more longevity risk in addition to increasing market risk. Investing FICA taxes in the market would mean increasing your financial risk in hopes of mitigating your human capital risk, which is all perfectly fine if your overall financial situation in retirement calls for more risk. If you have a huge private pension and little savings to invest, for example, that might be the case. Increasing your Social Security benefits by delaying claiming them would decrease both your financial risk, because you would be investing less, and your longevity risk by making sure that you or a surviving spouse will have more income guaranteed if one of you lives a long time. When we ask if we would be better off with stock investments than Social Security benefits, we're asking if it is better to gamble that our investments will do well and we won't live a long time or to buy insurance that will increase our income if we do live a long time. The ideal answer is to have enough wealth to do some of each. This is the basis for a floor-and-upside income strategy. But what if it does? What if my house burns down? What if I live to an old age? What if my widow lives to a very old age? Some risks, like long-term care costs, home insurance, and living to 95 are, as my cousin in the insurance industry likes to say, not easy to out-save. When there is a low-probability, high-magnitude risk and insurance is affordable to protect against it, then insurance is the most effective way to deal with that risk. The answer is adverse selection. If only people who really need insurance buy insurance, any kind of insurance, that insurance is doomed to failure. Successful insurance only works when claims are random and uncommon. Adverse selection increases the price of life annuities (SPIAs and DIAs), as well. People who don’t expect to live long buy life insurance, not annuities. Those who buy annuities are those who think they will live longer, so the price goes up. If only poor people or old people enrolled in Social Security, it couldn’t work. So, why am I bothered by someone asking if investing is better than insuring? Because they are not the same thing, so “better” depends on what you are trying to achieve. Is an umbrella better than sunscreen? It is if it rains. Investing and buying insurance are two very different propositions. Even if your personal preference is to bet everything on the market, you should do so understanding this difference. A bit of housekeeping. The URL "www.theretirementcafe" recently became available and now brings you here! Please bookmark it.